Walking up Dalmaji Hill, one cannot help but smell a mouthwatering aroma that is noticeably out of place. This smell of Italy comes from "Il Sole," a new Italian restaurant that brings a little bit of classic Italy to Busan. If there is one country that knows what good food is all about, it’s definitely Italy. Finding real authentic Italian food in South Korea, however, can often be an arduous undertaking. 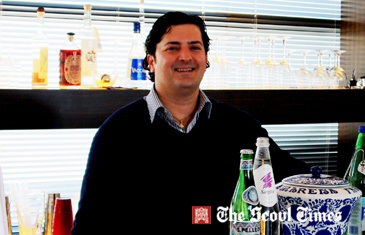 Italian restaurant owner Rodolfo Patella has embarked on the task of providing Korea with an authentic taste of his home country. He now owns two Italian restaurants in Korea — one in Seoul and the other in Busan. When it comes to his restaurant Rodolfo has one main concern, which is shared by most other ethnic Italian restaurant owners in Korea: doing Italian food right. He uses Il Sole to show Korea exactly how Italian food should taste. There are thousands of Italian restaurants in Korea, but most lack a certain quality that makes their food bona fide Italian cuisine. It can be hard to find that raw taste of Italy that makes people smile and satisfies stomachs. Rodolfo, and other ethnic Italians who own restaurants, strive to introduce Korea to genuine Italian food. For them, real Italian food should not be open to transformation or alteration. “Our Italian community is very small. It’s not a large community, but we wanted to make Italian food and do it right,” explains Rodolfo. For Rodolfo, it’s all about a quality product that tastes great. He focuses on making his dishes healthy and everything is made fresh from scratch right there in the kitchen. Food that is of poor quality has no place in his restaurant. “If the quality of the product is good, then you don’t have to cover up the taste with anything else,” says Rodolfo. His food certainly backs up his philosophy. The six-page menu is an alluring depiction of Italy's traditional cookery at a reasonable price. It starts with succulent appetizers, including Antipasto Salad and the ever so popular Minestrone soup. Stylish main dishes range from classic Rigatoni alle Melanzane, Penne al Peperoncino, and Lasagna Emiliane to appetizing meat fillets cooked in delicious sauces and herbs, plated with fresh vegetables and fragrant cheeses. For those in search of something simple yet delectable, several types of traditional spaghetti and an assortment of pizzas are available to satisfy any number of appetites. All these foods are backed by an extensive wine list to complement each meal. Rodolfo is a wine connoisseur and ensures that every bottle set on his tables is top quality vino. If diners still have room after this captivating assault on their taste buds, the menu finishes with flavorsome Italian desserts and coffees. The food matches up well with the ambiance of Il Sole, creating a pleasurable dining experience. There is a simple and relaxed, yet elegant atmosphere surrounded by an open feeling of Italian warmth in the restaurant. This is a feeling that Rodolfo has worked to create. “I want to keep everything at a slow pace. I don’t care how many people there are. It‘s about atmosphere, good food and experience,” he says. On Friday and Saturday nights, guests are treated to live music to enhance their dining experience. Rodolfo is an affable host who is dedicated to his restaurant and customer satisfaction. He wants Korea to taste the real Italy and experience his home country through the food. Even after being away from Italy for so long, he hasn’t lost his touch. He came to Korea originally as a ballet dancer with the Universal Ballet Company in Seoul in 1989. After many years of performing all over the world, he decided to stop dancing and embark on a new path in his life. That is when he decided to go into the restaurant business and reveal his culture of Italian food to Korea. Rodolfo is from the southern part of Italy known as Puglia. Being located right in the heel of the Italian Peninsula, he had the opportunity to travel to different countries and enjoy their food. This experience is what inspired him to bring real Italian food to Korea. Rodolfo goes on to explain that Italy is divided up into twenty different regions. According to Rodolfo, each region has its own unique style of preparing Italian cuisine. It was the taste of Southern Italy, the region where he grew up, that he wanted to bring with him to Korea. As head chef, Sebastiano Giangregorio, was from Bologna, he fused the two regions’ cooking styles together to make a unique but authentic taste of Italy to present to the Korean Peninsula. Sebastiano not only serves as head chef, but also helps train the Korean cooking staff on Italy’s finest secrets and techniques of food preparation. For Rodolfo, Korea is a safe and enjoyable place to live with amiable people that have made him feel welcome. It also offered him a chance to start his own restaurant and the means to accomplish his own success. His cordial adulation for Korea prompted him to venture into the world of restaurant ownership. After years of success in Seoul owning another Italian eatery, he has moved his business ideas and tasty Italian food to Busan. Il Sole recently opened on Dalmaji Hill in the Haeundae area of Busan. The location of the restaurant and its view set the restaurant apart from others. It’s an ideal spot for any occasion, including wedding proposals. “Someone proposed on this terrace the other night,” Rodolfo says. “I don’t know if she said yes or no,” he laughs. With that view, it would be hard for someone to say no. From the top floor, where a spacious terrace is set up with chairs and tables, there is an absolutely outstanding view of Busan. Haeundae Beach, the skyline, Diamond Bridge, and the waters of the South Sea can all be seen from the restaurant. “This spot represents a good image of Busan,” says Rodolfo, as to why he chose this stunning location for his restaurant. Il Sole has enjoyed success in Busan, and is popular among Koreans and foreigners. It is gaining recognition as having the best Italian menu in Busan. The restaurant also goes beyond providing Busanites with delicious food. Rodolfo remains active in the community and jumps at any chance to give back to the society he lives in. Recently, Rodolfo opened Il Sole’s doors to host an event for orphaned children on Children’s Day. He donated his time and money to help put smiles on the faces of young kids without families. He also sponsors other events and looks for new ways to benefit the community. When he is not moving about his restaurants ensuring top quality service to his clientele, Rodolfo likes to spend time with his family and entertain his two-year-old daughter. As Rodolfo stares out at the beautiful view from his terrace, he shares the key ingredient to running a successful restaurant. “Purpose what you really like and want. Believe in what you do and stick to that. Don’t try and change things to keep up with trends. If I did other things, then it wouldn’t be my restaurant. It’s a choice to do it how you want,” he adds. As Il Sole continues to dish up delicious traditional Italian food, coupled with gratifying service and a hospitable ambiance, a little bit of Italy will be savored in Busan. 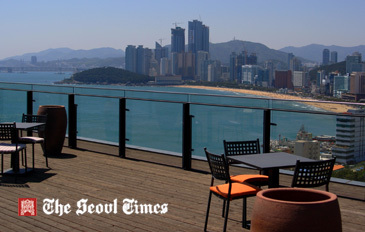 Il Sole is located at Dalmaji Hill on the 5th floor of the Sedec Building in Busan.